Summary. Aim: Intrathyroid metastases are uncommon in cytology practice. We report a case of metastatic lesion in the thyroid from breast carcinoma which was recognized in a fine-needle aspiration (FNA) biopsy and confirmed by immunohistopathology. In addition, we provide an overview of the literature describing similar cases. Study design: The patient was a 54-year old woman with a large, multinodular goiter and bilaterally enlarged lymph nodes in the supraclavicular areas. Fourteen years earlier she had undergone radical mastectomy followed by chemio- and radiotherapy due to a breast carcinoma. Results: FNA of the thyroid nodules showed a metastatic breast carcinoma and was followed by total strumectomy and lymphadenectomy. Histological reassessment of the surgical thyroid specimens as well as the neck lymph nodes revealed multiple breast metastases. This was strongly confirmed by immunohistochemical examinations, which revealed a positive staining for: CKMNF 116, CK7, CEA as well as for ER, PgR and HER2, and a negative staining for: CK20, thyroglobulin, TTF1, calcitonin, and chromogranin. Conclusion: Every new aggregate in the thyroid in patients with even a long-term history of cancer should be considered as potentially metastatic until proved otherwise. FNA could be helpful in the diagnosis of thyroid metastatic lesion, but it should be confirmed by immunohistopathology. Abbreviations used: CEA — carcinoembryonic antigen; CK7 — cytokeratin 7; CT — calcitonin; ER — estrogen receptor; FNA — fine-needle aspiration biopsy; HER2 — herceptin receptor; MGB2 — mammoglobulin 2; PgR — progesterone receptor; TG — thyroglobulin; TTF-1 — thyroid transcription factor 1; USG — ultrasonography. Although, the possibility of a metastasis from non-thyroid cancers to the thyroid gland is rare, it should be taken into account, because it is not as infrequent as widely believed. Generally, the primary tumor is found in the kidneys, gastrointestinal system (like the esophagus, stomach or colon), bronchi, or breast [1–15]. Several reports have indicated the iris, parotid, uterus, leiomyosarcoma, oropharynx squamous cell carcinoma or lingual squamous cell carcinoma as the less common origin of the metastatic thyroid lesions [2, 4–6]. The occurrence of metastases depends on the character of the material analyzed. Commonly, metastases to the thyroid gland are identified upon autopsy and according to various reports, the value ranges from 1.25–24.2% [2, 5, 7, 16]. Very few studies mention metastatic disease in clinical material, where it is estimated at 2–3% of all malignant tumors diagnosed in the thyroid . With regard to its origin, the most common primary tumor site seems to be the kidney [1–4, 7, 8, 12]. Breast cancer is less frequent, but a new thyroid mass should be considered as a metastasis of breast carcinoma in any patient with a former history of this malignancy. Breast metastatic cancer is evaluated at ca. 16.0 to 32.0% in postmortem examinations, but only 4.0–9.0% cases are encountered in clinical papers [2, 8, 13]. Metastatic disease of the thyroid could present as single nodule, multinodular goiter or thyroiditis [2, 10]. Although fine needle aspiration biopsy of the thyroid lesions is helpful in the thyroid metastasis nodules [17–22], histopathological verification and immunohistochemical (IHC) examination are recommended for the final diagnosis [17–22]. 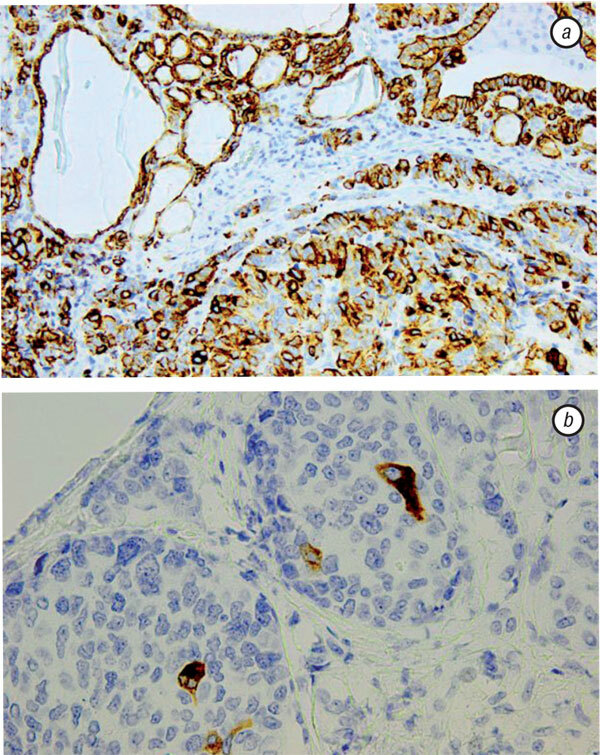 Especially, IHC staining proves very useful in differentiation diagnosis between primary thyroid tumors on the one hand and metastatic breast carcinoma on the other. In case of metastatic thyroid tumour IHC staining for calcitonin (CT), thyroglobulin (TG) and thyroid transcription factor 1 (TTF-1) is negative [23, 24]. On the contrary, CKMNF 116, cytokeratin 7 (CK7), carcinoembryonic antigen (CEA) and mammoglobulin 2 (MGB2) are specific and sensitive markers and should be positive in metastatic breast cancer . In addition, estrogen and progesterone receptors (ER, PgR) as well as herceptin receptor (HER2) might be evaluated in metastatic breast cancer . 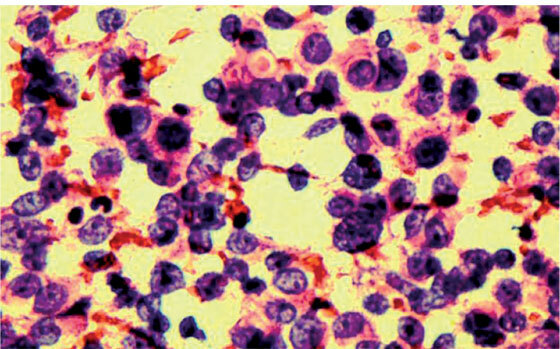 In this paper we report a case of metastatic lesion in the thyroid from breast carcinoma which was suspected in fine needle aspiration (FNA) biopsy and confirmed by post-operative histopathology and immunochemistry. In addition, we provide an overview of literature describing similar cases. A 54-year-old woman with enormous multinodular goiter categorized as IV according to World Health Organisation (WHO) was admitted to our hospital after complaining of a dyspnoea and stridor. Fourteen years earlier she had been diagnosed with carcinoma in the left breast classified as ductal-lobular mammary carcinoma (T1N1bM0) for which she had undergone radical mastectomy and limfadenectomy with subsequent chemiotherapy in accordance with Ansfield’s scheme (cyclophosphamide, methotrexate, fluorouracil, vincristine,and prednisone) and radiation therapy (50 Gy). At the same time, in the right breast dysplasia occurred. The disease was asymptomatic for 6 years, and after that period developed skeletal metastases for which the patient underwent radiotherapy and for the next four years she received Nolvadex. Moreover, one year later metastases in the region of cicatrice occurred. The patient received brahytherapy to the whole upper-left side of the chest where the cicatrice was situated by external beam irradiation aiming at 30 Gy. Afterwards, she received doxorubicin (Adriblastin), vinorelbine (Navelbine) and consecutive radiation therapy was administered in the region of the left breast. Furthermore, as regards systemic therapy, the patient was controlled by hormonal therapy using hormone-blocking medications, such as anastrozolu (Arimidex). At the same time, metastatic disease in the suprarenal gland was suspected. No further recurrences were noticed for two years. When the patient was admitted to our institution, thyroid ultrasonography (USG) showed heterogenous multinodular goiter with a total volume of 78 ml. Bilaterally, in supraclavicular areas, two packets of lymph nodes (probably metastatic) were noticeable. These pre-operative investigations with USG and FNA strongly suggested or verified metastases from the breast cancer. A technetium-99m bone scintigraphy showed multiple metastases which were located in the head of the humeral bone, the left ilium, the right femoral bone as well as in the lower subscapular angle of the right scapula and sacrum on the S1 level. The pancreas and spleen revealed no changes. Mammography of the right breast showed no abnormalities. According to investigations, the patient was euthyroid (serum TSH, fT4 and fT3 levels in normal range) and a total thyroidectomy was performed, resulting in a histological diagnosis as metastatic breast carcinoma infiltrating the surrounding blood vessels. At the time of surgery bilateral neck limphadenectomy was executed and histological reassessment of the surgical specimens of lymph nodes revealed multiple breast metastases. 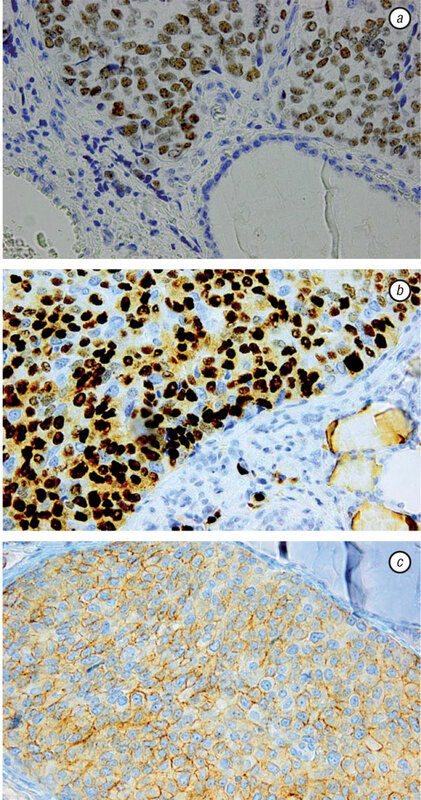 Consequently postoperative specimens were taken for IHC stains, which showed positive results for: CKMNF 116 (+), CK7 (++), CEA (+) and MGB2 (++), and negative staining for: CK20, TG, TTF1, CT, chromogranin (Fig. 1 a, b, 2 a, b). IHC staining confirmed the metastases from the breast cancer. 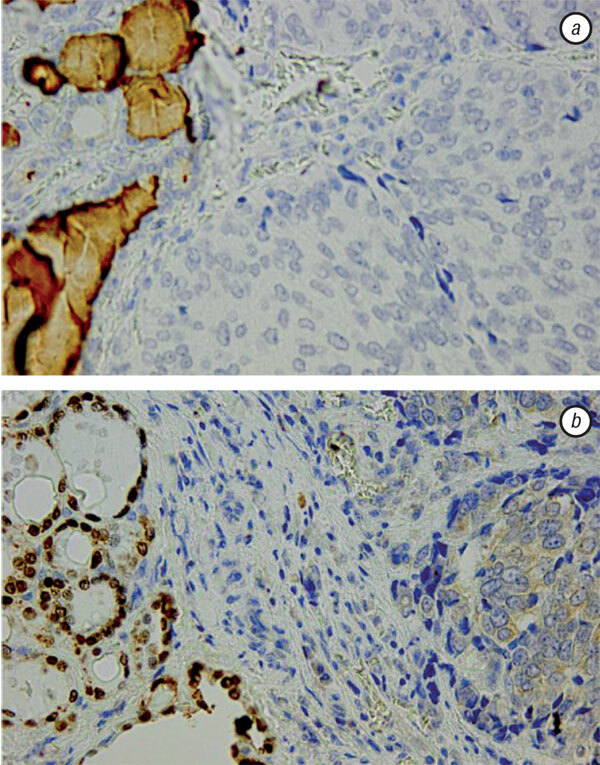 In addition, IHC staining for expression of progesterone and estrogen receptors (ER and PgR) as well as herceptin HER2 showed positive reaction (Fig. 3, 4 a, b, 5 a, b, c). Post-operatively the patient received L-thyroxin in a daily dose of 125 µg. After surgery the plasma level of Ca-15.3 increased, and three, four and five months later amounted to 216.2 U/ml, 339.7 U/ml, 402.0 U/ml, appropriately (norm: 0.0–30.0 U/ml). Unfortunately, in the same year metastases to the liver were found (our earlier investigations demonstrated only two hepatic cysts in the right lobe of the liver and steatosis). Regrettably, other examinations showed metastases to the right lung. According to these investigations chemiotherapy was carried out one more time (Mitroxanton, Taxotere and Xeloda) but because of cancerous cachexia and no possibilities of chemiotherapy, she was directed to the Outpatient Clinic Against Pain. She died three years later. In present study, metastasis to the thyroid gland occured 14 years after diagnosis of the primary disease. The thyroid deposit was the third site of distant metastases. Metastatic breast cancer will cause symptoms that depend on the location of metastasis. Most common site of metastasis include: bone, liver, lung and brain. In the thyroid it is usually present as single or multiple nodules, but also enlarged nodular goiter or thyroiditis [2, 10]. Most commonly, patients reported the feeling of pressure and enlarged neck circumference. Therefore some patients with metastatic lesion presented hoarseness, dysphagia, stridor and dyspnea, but respiratory problems are less frequent symptoms and occur mostly when the disease develops quickly [2, 3]. Unquestionably, the thyroid gland has an affluent blood supply close to 560 mL/100 g tissue/min, which is denoted to be second only to the adrenal gland . Despite that, this gland is a rare site for metastatic disease to develop [2, 14]. Based on these data, we recommended that the diagnosis of metastatic disease ought to be suspected in patients with even a remote history of cancer, no matter how remote that history is. Every new aggregate in the thyroid should be considered as potentially metastatic until proved otherwise. A differential diagnosis should be carried out in the case of multinodular goiter as well as benign thyroid nodules. Gerges et al. reported that breast and lung cancers are the most common diseases metastating to the thyroid gland in most autopsy series in contrast to clinical series, where the most frequent is renal cell carcinoma . Unquestionably, the knowledge of the whole clinical history of the patient is very helpful for making this diagnosis. In our case, the thyroidectomy was performed 14 years after the initial diagnosis. Upon reviewing the literature the involvement of the thyroid generally becomes apparent or at the same time or from a few months to 12 years after the diagnosis of the primary tumor [3, 5, 10, 13, 15, 17, 18, 20, 21]. Our data showed that these intervals could be even longer. In the association of widespread metastatic lesion, usually the clinical manifestation of metastatic disease has no importance. In addition, the long interval between the original primary tumour and subsequent thyroid metastases submitted a diagnostic problem. Thyroid metastases from breast cancer are uncommon but routine use of fine needle aspiration could help detect it more frequently . FNA biopsy plays an important role in the whole diagnostic process, since it may confirm a clinical suspicion. What is more, it is a safe, inexpensive and simple procedure . The patient described underwent preoperative FNA, which suggested metastatic thyroid lesion from the breast cancer. Breast metastatic carcinoma to the thyroid is uncommon phenomena in cytology practice and may give a diagnostic dilemma particularly in the presence of some morphologic similarities with primary thyroid lesions. So histopathology results should be confirmed by IHC examinations. TG and calcitonin CT as well as TTF1 may be usefull markers for distinguish breast metastatic lesions from primary thyroid lesions [23, 24]. Normal thyroid follicular cells are stained strongly for TG protein, which allows the TG expression obtained to confirm the histogenesis of nonmedullary carcinomas comprising thyroid cancer of follicular cell origin . On the other hand, CT and its mRNA is mostly considered as the most important specific marker of parafollicular cells (C-cells) and is considered as obligatory for the diagnosis of medullary carcinomas derived from C-cells in humans. Furthermore, IHC staining for mRNA-CT and peptides are detected in all C-cell lesions . Metastatic tumors in the thyroid gland showed negative staining for both TG and CT in the metastatic cells. Moreover, TTF-1 regulates the transcription of thyroid-specific genes in thyroid follicular cells and activates Tg and TPO (thyroperoxidase) gene transcription in thyroid carcinomas. The overexpression of TTF1 could be an usable marker not only for follicular cell tumors and but also for C cells and medullary thyroid carcinomas . The next marker which was negative in patient described was chromogranin A (CHGA). It is secreted by a great variety of peptide-producing endocrine neoplasms: pheochromocytoma, parathyroid adenoma, medullary thyroid carcinoma, carcinoids, oat-cell lung cancer, pancreatic is let-cell tumour and aortic body tumor, so it can be helpful for exclusion C-cells carcinoma . To diagnose a primary carcinoma metastasizing to the thyroid many IHC markers should be evaluated. There are several factors that must be taken into consideration to confirm the thyroid metastases from the breast cancer. The most useful seem to be the following: MGB2, CEA, ER, PgR, HER2 [25, 26, 28]. MGB2 is expressed in normal human breast, uterus and salivary gland; but over expression of MGB2 is seen in breast tumour. In case studied IHC for MGB2 showed moderate staining in 70% of tumour cells. Otherwise CEA is a tumor marker widely used for evaluating patients with breast cancer and seems to be associated with a poor prognosis . In addition, immunohostochemical expression of both estrogen and progesterone receptors as well as transmembrane protein HER2 in postoperative thyroid specimens from patient studied were investigated and showed strong positive reaction (over 75% of cells nuclei) for ER and PgR and moderate positive reaction for HER2. These three markers are rather prognostic and predictive one of response therapies, both in early and metastatic breast cancer [26, 29–31]. IHC analysis revealed also moderate reactivity for CK7 (++), in spite of negative reaction for CK20. The last one is a prominent marker rather for intestinal and gastric epithelium, urothelial umbrella cells and Merkel cells of epidermis as well as in the thymus, bronchus, gallbladder and prostate gland. From blood markers most often used to follow patients with advanced breast cancer or its recurrence after treatment, CA15.3, CEA and CA27.29 indicated high serum levels in patient studied . To conclude, FNA and IHC stainings might to ascertain whether the thyroid nodule is a primary or a metastatic lesion. Very few studies indicated the type of metastatic breast carcinoma (Table). Loo et al., 2003  showed neuroendocrine breast carcinoma to be the origin of the metastatic thyroid lesion . Owens et al., 2005  showed that infiltrating mammary carcinoma could cause metastatic disease. 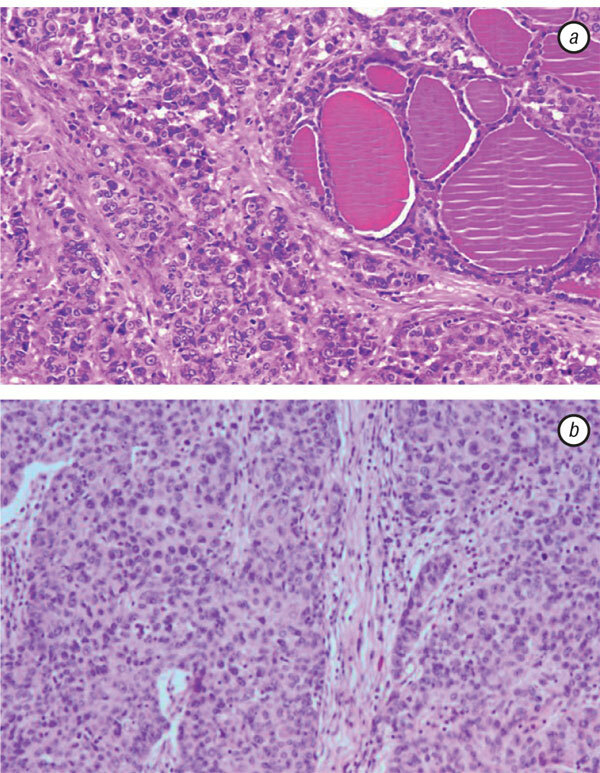 Gong et al., 2005  described metastastic breast carcinoma as a mesenchymal or squamous cell carcinoma connected with ductal carcinoma. In the literature there was also a case where breast carcinoma metastatic to follicular variant of papillary thyroid carcinoma developed . Furthermore, USG and mammography should be performed where there is any suspicion of thyroid cancer or breast cancer due to the possibility of both coexisting. Based on the reported case we conclude that the diagnosis of metastatic disease ought to be suspected in patients with even distant history of cancer, no matter how remote that history is. A review of the literature showed that metastases to the thyroid gland does not depend on histological type of the breast carcinoma. In view of the above, we deduce that every new aggregate in the thyroid should be considered as potentially metastatic until proved otherwise. Note: IHC — immunohistochemical staining. Calzolari F, Sartori PV, Talarico C, et al. Surgical treatment of intrathyroid metastases: preliminary results of a multicentric study. Anticancer Res 2008; 28: 2885–8. Chen H, Nicol TL, Udelsman R. Clinically significant, isolated metastatic disease to the thyroid gland. World J Surg 1999; 23: 177–81. Cichoń S, Anielski R, Konturek A, et al. Metastases to the thyroid gland: seventeen cases operated on in a single clinical center. Langenbecks Arch Surg 2006; 391: 581–7. Dequanter D, Lothaire P, Larsimont D, et al. Intrathyroid metastasis: 11 cases. Ann Endocrinol (Paris) 2004; 65: 205–8. Gerges AS, Shehata SR, Gouda IA. Metastasis to the thyroid gland: unusual site of metastasis. J Egypt Natl Canc Inst 2006; 18: 67–72. Papi G, Fadda G, Corsello SM, et al. Metastases to the thyroid gland: prevalence, clinicopathological aspects and prognosis: a 10-year experience. Clin Endocrinol (Oxf) 2007; 66: 565–71. Nakhjavani MK, Gharib H, Goellner JR, van Heerden JA. Metastasis to the thyroid gland. A report of 43 cases. Cancer 1997; 79: 574–8. Wood K, Vini L, Harmer C. Metastases to the thyroid gland: the Royal Marsden experience. Eur J Surg Oncol 2004; 30: 583–8. Ferrara G, Ianniello GP, Nappi O. Thyroid metastases from a ductal carcinoma of the breast. A case report. Tumori 1997; 83: 783–7. Jimenez-Heffernan JA, Perez F, Hornedo J, et al. Massive thyroid tumoral embolism from a breast carcinoma presenting as acute thyroiditis. Arch Pathol Lab Med 2004; 128: 804–6. Koev D, Chavrakov G, Koeva L, et al. Basedow’s disease in a female patient with breast cancer metastasizing to the thyroid. Vutr Boles 1987; 26: 126–31. Machens A, Dralle H. Outcome after thyroid surgery for metastasis from renal cell cancer. Surgery 2010; 147: 65–71. Tutal E, Tütüncü NB, Akçaer N, et al. Unusual case of metastatic thyroid nodule: nonpalpable breast mass as origin. Endocr Pract 2001; 7: 379–82. Lam KY, Lo CY. Metastatic tumors of the thyroid gland: a study of 79 cases in 4 adenomyoepithelioma of the breast with metastasis in the thyroid gland 12 years after excision of the primary tumor. Case report and review of the literature. Virchows Arch 2000; 436: 158–66. Leboeuf R, Bénard F, Langlois MF. Thyroid cancer presenting as a PET incidentaloma in a patient with concomitant breast cancer metastases to the thyroid. Clin Nucl Med 2006; 31: 382–5. Takashima S, Saeki H, Moriwaki S, Yamamoto Y. An autopsy case of metastatic thyroid tumor. Gan No Rinsho 1984; 30: 880–4. Loo CK, Burchett IJ. Fine needle aspiration biopsy of neuroendocrine breast carcinoma metastatic to the thyroid. A case report. Acta Cytol 2003; 47: 83–7. Owens CL, Basaria S, Nicol TL. Metastatic breast carcinoma involving the thyroid gland diagnosed by fine-needle aspiration: a case report. Diagn Cytopathol 2005; 33: 110–5. Smith SA, Gharib H, Goellner JR. Fine-needle aspiration. Usefulness for diagnosis and management of metastatic carcinoma to the thyroid. Arch Intern Med 1987; 147: 311–2. Gong Y, Jalali M, Staerkel G. Fine needle aspiration cytology of a thyroid metastasis of metaplastic breast carcinoma: a case report. Acta Cytol 2005; 49: 327–30. Kim TY, Kim WB, Gong G, et al. Metastasis to the thyroid diagnosed by fine-needle aspiration biopsy. Clin Endocrinol (Oxf) 2005; 62: 236–41. Yu J, Seethala RR, Walls A, Cai G. Fine-needle aspiration of breast carcinoma metastatic to follicular variant of papillary thyroid carcinoma. Diagn Cytopathol 2009; 37: 665–6. Wagner K, Arciaga R, Siperstein A, et al. Thyrotropin receptor/thyroglobulin messenger ribonucleic acid in peripheral blood and in fine-needle aspiration cytology: diagnosis synergy for detecting thyroid cancer. J Clin Endocrinol Metab 2005; 90: 1921–4. Saller B, Feldmann G, Haupt K, et al. RT PCR based detection of circulating calcitonin-producing cells in patients with advanced medullary thyroid cancer. J Clin Endocrinol Metab 2002; 87: 292–6. Harris L, Fritsche H, Mennel R, et al. American Society of Clinical Oncology 2007 update of recommendiations for the use of tumor markers in breast cancer. J Clin Oncol 2007; 25: 5287–312. Zaineddin AK, Vrieling A, Buck K, et al. Serum enterolactone and postmenopausal breast cancer risk by estrogen, progesterone and HER2 receptor status. Int J Cancer 2012; 130: 1401–10. O’Connor DT, Deftos LJ. Secretion of chromogranin A by peptide-producing endocrine neoplasms. N Engl J Med 1986; 314: 1145–51. Becker RM, Darrow C, Zimongic DB, et al. Identification of mammoglobulin B, a mouce member of the uteroglobulin gene family. Genomic 1998, 54: 70–4. Shahi KS, Bhandari G, Singh A. Steroid receptor status and its clinicopathological correlation in post menopausal breast cancer patients of Kumaon region of Ultarakhand. J Cancer Res Ther 2011; 7: 19–22. Allegra JC, Lippman ME, Thompson EB, et al. Distribution, frequency and quantitative analysis of estrogen, progesterone, androgen and glucocorticoid receptors in human breast cancer. Cancer Res 1979; 39: 1447–54. Ise C, Gauchez AS, Jacot W, Lamy PJ. HER2 shedding and serum HER2 extracellular domain: biology and clinical utility in breast cancer. Cancer Treat Rev 2012; 38: 133–42.